The Krishna Paksha Amavasya of the Ashwin or Ashwayuja month of is observed as Diwali or the no moon day in the month of Aswayuja of the lunar calendar is celebrated as Diwali. Aipasi is the name of the month as per the Tamil calendar in which Diwali is celebrated. Diwali of this year is celebrated on Wednesday, 7th November, 2018. 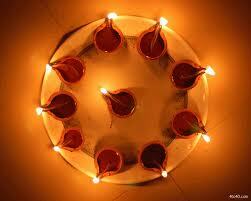 Diwali is the common word for the Sanskrit word Deepawali or Deepavali. Deepawali of Deepavali means a lights placed as a row. Deepa means light and Wali or Vali is arrangement in a line or row. On Diwali lots of Deepas or Diyas are light and are used to decorate houses and business establishments to welcome Goddes Lakshmi or Laxmi. Diwali in North India is celebrated, as it is believed that it was on Diwali that Lord Rama along with Sita and Lakshmana returned to Ayodhya after killing the Demon king Ravana in Lanka. In South India Diwali is celebrated,as it is believed that the demon king Narakasura was killed by Lord Krishna with the help of his wife Satyabhama on Diwali. The rituals at the home on the day of Diwali start early in the morning. All the members of the family apply oil on their bodies and take a head bath. It is believed that Goddess Lakshmi or Laxmi resides in the oil on Diwali and hence is applied all over the body thought it is Amavasya. After head bath fire crackers are burnt and a sweet is eaten before eating anything. The main Puja is in the evening where Goddess Lakshim is worshipped and the house is decoratew with the maximum possible lights to welcome Goddess Lakshmi into the house. After Laksmi Puja is done. fire crackers are burnt by one and all. Business establishments would clean and paint their shops or establishments for Diwali. Lakshmi Puja is performed on a grand scale in the evening after which sweets are distributed. Diwali marks the start of new financial year at few places of country and new account books are opened on Diwali closing the old ones. After the Lakshmi Puja is done firecrackers are burnt in front of the business establishment. Other common rituals of Diwali are distributing of sweets among relatives and friends. Gambling or playing of cards is a common ritual in some parts of the country.